Digital Marketing Services in Hyderabad! We are the leading in 360 Degree Digital Marketing Companies in India. We are a pioneer in driving the best results in Content Marketing, SEO, PPC Advertising & Social Media Marketing, Email, And Mobile Marketing. We have helped many of our Clients with our Digital Marketing Solutions. Our professional staffing services Include: temporary & permanent Staffing Services, It & Non-It Recruitment Sieve Softech staffing specializes in Lateral recruitment solutions & services to fulfill your hiring needs for agencies, product companies, and Tech Startups in Hyderabad. Sieve Softech offers responsive web design and Web Development with PWA And AMP Capabilities. During page designing, we work on major e-commerce platforms, ERP & CRM Capabilities. Our design SEO friendly websites & compatible with better search engine presence. Sieve Softech is Hyderabad’s leading branding Services agency that helps brands to realize their true potential with a wide range of strategy and design solutions. Our Branding Services include Logo Design, Print Media, UI/UX Designing etc..
Sieve Softech is the best Software Development Agency for Android, iOS and Windows App Development. 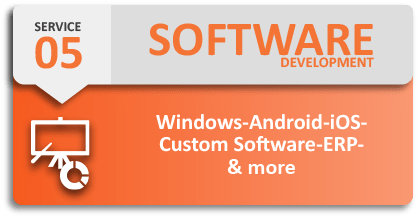 We Know that every business has a different software requirement and we serve them with a Custom Software Development Solutions. We are the Best Corporate Training Agency for companies. Offering training Services for Digital Marketing, Web Designing, SAP All Modules, and App Development etc. We have real-time experienced trainers. Best quality gives you the best results. Get the best results by taking our best services. Being available is most important than being manageable. We provide 24/7 email and community based support. We will provide you the best results at affordable cost. We will provide client dashboard to update the project status and progress along with client support! 30-day money back guarantee is only a part of the measures we take to make sure our clients receive excellent service. We Provide Monthly Reports and Conduct Meetings to our Clients. SieveSoftech is a Best Digital Marketing Agency that offers proven result oriented Digital Marketing services that includes brand recognition, potential customer reach through online. Sieve Softech, Full-service Digital Marketing Agency helped me a lot in boosting the online presence, branding and lead generation for all my business solutions with cutting edge technologies. The Digital Marketing team was very enthusiastic and supportive. I strongly recommend Sieve Softech for the clients globally for lead generation.